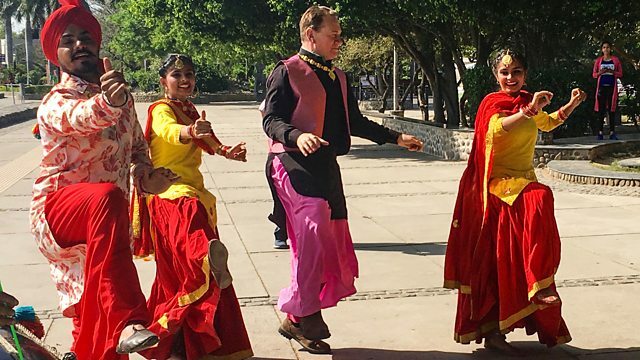 Guided by his Bradshaw's 1913 Handbook of Indian, Foreign and Colonial Travel, Michael Portillo embarks on a classic rail journey from Amritsar to Shimla. Browse content similar to Amritsar to Shimla. Check below for episodes and series from the same categories and more! to Indian, Colonial And Foreign Travel. ..where magnificent beasts roam, and epic stories are told. and ride some of the most exhilarating trains in the world. who today live in the largest democracy in the world. making this the breadbasket of India. Here is the spiritual home of the Sikhs. by the time of my Bradshaw's guide they were Britain's loyalest allies. the Punjab was divided between India and Pakistan. including along the line where I will travel. from the British Raj to the India of today. This is the most northerly of my four journeys in India. in the Golden City of Amritsar. I'll travel through fertile farmland to the city of Ludhiana. and the hill station of Shimla. and trains, paradoxically, become a very easy target. being ruled from this tiny village. It's bizarre. ..and go on a train journey of a lifetime. Chugging through the foothills of the Himalayas. Now, this is what I call a great rail adventure. due to an atrocity there in 1919. "who consider it a meritorious act to contribute to its adornment." which paradoxically has produced some of the fiercest warrior lions. who use India's vast rail network every day. My first experience of an Indian railway station - it's teeming. Amritsar is one of Punjab's largest and most important cities. during the 18th and 19th centuries. dates back to that period. a building made of more-dazzling material. and every day welcomes over 100,000 visitors from all over the world. known to Sikhs as Harmandir Sahib. I'm hoping I'll see these again. before entering this spectacular spiritual complex. The Bradshaw description is perfect, even for today. "the roof is covered with a thin layer of gold. "It is placed in the middle of a large tank. "and the marble pavement borders the lake." and despite the enormous crowd, there's a sense of tranquillity. I'm meeting a British pilgrim. that I have ever seen. Tell me about its origins. by our fifth Guru, Guru Arjan. He wanted a building which was accessible to all. they're all grand, majestic, domineering structures. And yet here, you see it's lower than the surrounds. Every feature of this building shows humility. the windows are small, the building itself is very small. "but indulge in opium or cherry brandy." they will not touch alcohol or intoxication of any kind whatsoever. a social hierarchy determined by birth. Sikhism embraced the idea of welcome to all. And here, they practise what they preach on an astonishing scale. This is the world's largest free kitchen. but not to such numbers. so anyone from any religion can share in the meal. by a team made up entirely of volunteers, which I'm going to join. I've never been in such a crowd in my life, nor such a colourful crowd. maybe 100,000 a day, will be fed a meal for nothing. The hall can seat 3,000 people at a time. The feeding of the thousands is spectacular. And with one sitting over, serving begins again. This time, I'll be receiving my own portion. I'm making my way a short distance to the Jallianwala Bagh. where pilgrims and visitors rest after visiting the Golden Temple. and which marked the beginning of the end for the British in India. because of the narrowness of the entrances - thank goodness. and many men, women, and children went to the gardens to celebrate. This large space was filled with thousands of people. and to continue firing for ten minutes. General Dyer's troops fired until their ammunition ran out. and strengthened the cause for independence. in relentless firing by British soldiers, without warning. a journey of two hours. How do you do? How do you do? What's his name? -Does he travel by train very much? -This is his second trip. -He looks pretty relaxed at the moment. Yeah, so far, so good. We were just going to Amritsar, the Golden Temple. Now, are you a Sikh? No. We're not Sikh, but Hindu. -But you go to the Golden Temple? It's good to learn about different religions, I think. -That's a very interesting philosophy. I didn't even have to pay for it. Excuse me. I'm enjoying using the trains in India. Do you use them a lot? I enjoy the trains very much in India. -you meet friends very easily in the trains. -So I see, so I see. -Like this gentleman, we met him today, only two hours back. Well, how very, very nice. And... Oh, thank you! a railway ticket. Tell me what the options are in India. Options are, for the poorer people we have a 2nd class. and 1st AC, and maybe a chair car like this. -We have three or four options. -So AC meaning air conditioning? You don't get people riding on the roof any more? I can't say that, but it has reduced. But still, it has much, much improved. and now we're talking about even bullet trains. Maybe in the next couple of years, we'll have bullet trains. That was a dream but now it's coming true. so I'll explore this city in the morning. Full of traffic and noise. and there is industry everywhere you look. It's also long been an important centre for education. "and of the Female Education Society. "The North India School of Medicine for Women is also here." and so this is the place to check up on it. and women make up just over half that number. and today is called the Christian Medical College. -Yeah, yeah, nice to meet you. and the director of the college. -all the way back in the 19th century? especially the women in the child-bearing age. Many of them were having difficulties because of it. -about being treated by a man? And she said, "I will start a medical school for women." moved by the plight of the women that she met. she set about training female doctors and midwives. It was very difficult to convince girls to take up medical studies. It attracted a lot of people from the work which was done. And the government was very supportive for her work. This became one of the important medical colleges in the country. Men were admitted as students to the college in 1953.
when he performed ground-breaking surgery on a nine-year-old girl. It was the first operation of its kind and was a huge success. and works at the college's teaching hospital. How long have you been a qualified nurse? I've been working in this institution. -And you enjoy the work? -Yeah, of course I enjoy it. I am happy working here as a staff nurse. Now, you yourself made medical history on one occasion. Well, was it not the very first face replant ever to be done? -Yeah, it was the very first. -I think that's medical history. are you thinking back to your experience as a patient? I'm thinking of my history and when I was a patient. I'm thinking of that time. -I'm sure you make a wonderful nurse. a dental college and a college of nursing. Does the name Edith Brown mean anything to you? We respect that name, we remember that name. I think she was a very brave woman. and I think she was a great woman. but it is one of its most important. 82% of all land is used for farming. I've come to the countryside surrounding Ludhiana. "is that the staple food of India is rice. "But this is only the case in Bengal and steamy districts. "and wheat is largely grown." agriculture in India has had to come a long way. has helped to secure Punjab's title as the granary of India. This small state produces around a seventh of all India's food grain. one of India's most ubiquitous foods, the chapati. I suppose, made of clay, but here it's very hot on the metal pan. with their fingers and flipping it over. ..hand it over for the addition of the clarified butter. And the next one goes in. Mm! The bread is absolutely delicious. Wow, that is so fresh, that's wonderful. but this line has been part of some very dark history. I'm joined by a professor of modern history. and it's known as a place where a lot of blood was spilt. Why? In August 1947, after 200 years, British rule in India ended. which was split into two halves, East and West. and the British had withdrawn. For the masses, it's the weary trail of the road. that has never been exceeded, even in India's stormy history. and Muslims in the opposite direction to Pakistan. And this exodus was accompanied by brutal violence. Some people take to the trains, believing they can escape to safety. Well, isn't that the real irony of it all? you believe that ticket is going to get you to where it's supposed to get you. and women being abducted and raped. I mean, one could go on. one of these train massacres. Do they loom very large in the Indian imagination? I think you put that very well. there is always an iconic image which gets associated with it. it is the image of the moving trains, loaded with corpses. and more than ten million displaced. the Pakistani government and the British Empire? their attitude was one of complete indifference. "We were there to bring unity and you guys messed it all up." to divide a subcontinent of this proportion. I mean, I'm sorry to say, but this was nothing short of lunacy. They left without anything in place. Nothing was properly handed over. betrayal at Britain's handling of Partition. And there is continuing hostility between India and Pakistan. began with hatred and recrimination. which is now a heritage hotel. I've been joined by a friend for breakfast. And it's an Indian breakfast. and this is a dough that you dip in it. "to perambulate in the cool of the morning." I intend to perambulate in the city of Ambala. I'm taking a rickshaw into Ambala's busy centre. which connects the major cities of North India. "who carry their enormous large packs on their heads. "without much haggling, to which the European must submit." but after a while you begin to think of it as vibrancy, colour and life! These people really know how to live. In a place like this it's hard to resist the urge to shop. -As you see, I quite like bright colours. Yeah, I will show you the colours. Colours, yes, please. Bright colours, please. Yes. Don't bother with the dull ones. Look at that! That's spectacular. -Maybe a bit brown for me. -What about this colour, sir? -This is a wonderful colour, sir. I will get your measurements. -After that, I will tell you how much it will cost. Chest size, sir. You can breathe easy, sir. You're not in a gym. I think there must be a fault with your tape measure. are made to measure by a team of seamstresses. And in just a couple of hours, a tailored outfit is ready. Oh, Michael! Looks very nice. -Are these the ladies who were responsible? They have made your kurta and pyjama. -I will help you, sir. What do you think? Does that look nice? It's so elegant, isn't it? Now you are looking in full Indian dress-up. -Thanks to you. Thank you so much. I'm halfway through my journey and about to leave Ambala. to my final destination, Shimla. "seat of the Lieutenant Governor and military command." But nowadays, Lahore is in Pakistan. but the neighbouring one of Hariana. I smell something highly political. Chandigarh is a relatively new city. It was created in 1950 after independence and Partition. and I'm already noticing some rather curious sights, such as roundabouts. Chandigarh is quite different from anywhere I've been in India. It's so clean and tidy. There is greenery and flowers everywhere. It's like travelling to a different planet. in the commotion of India. Architecturally, it is overwhelmingly modernist. to find out how this city came to be. Why and when was Chandigarh built? there was a very traumatic partition. "How can we make a new capital?" They tried many cities, "Maybe you could expand this one or that one." Ultimately, they came to the conclusion, "Let's make a new city." What was intended with the building of Chandigarh? will be a symbol of the nation's fate in the future. that he'd been working on for 20 years. What was his philosophy of town planning? living, working, circulation and care of body and spirit. it had all the needs that you had. the roads, the more efficient people will be in their lives. Working, he had dedicated areas for offices and markets. in Chandigarh, the greens and the lakes, and the Leisure Valley. -of what a modern city should be. But there is nothing Indian about these buildings. That is where the genius of Corbusier comes in. There is no nothing in any building. You can't say it is British, it is Colonial, it is Mexican. It does not belong to any era. put into any slot. It is deliberately not Indian. has recently been awarded UNESCO World Heritage status. or to relax with an early evening walk. Very interesting. Do you enjoy living in Chandigarh? and we have a lot of greenery around here. so as compared to that, this is amazing. It strikes me as very different from everywhere else I've been in India. Yeah, actually, it is a planned city. This is what I have experienced, being from Delhi. You don't feel that it's too planned? No, I just love it because, you know, you can breathe. Bhangra is associated with the farmers of the Punjab. like sowing seeds and cutting wheat. I'm struck by its exuberance. And you know me - I'm itching to have a go. And if I'm going to engage I need to look the part. Well, now you've got me all dressed up, what is this dance? This is the dance of Punjab. we will perform dance only to feel happy. What is Vaisakhi? What does that mean? That is the festival of Punjab. There is, like...farmer festival. you look rather modern to me. It looked a bit like Bollywood. -So, Bollywood copies our folk dance. So, bhangra is the origin of it all? Another unforgettable moment in my dance career. I'm leaving Chandigarh on a commuter train. But my next ride will be anything but routine. my first view of these gorgeous mountains. while you're on this Earth. and today is one of the world's most celebrated mountain railways. Its regular services attract both domestic and international tourists. So, this is the train that's going to take me up to Shimla. Narrow gauge and, at first sight, it seems almost like a toy railway. These carriages are kind of cute. up to 7,000 feet over a distance of 60 miles. I've always wanted to ride this railway. up into the highest mountain range in the world. "by a fine piece of mountain engineering to Shimla." My guidebook is guilty of an understatement. it had 107 tunnels, 864 bridges and viaducts, and spectacular views. one of the great achievements of the railway age. on the UNESCO World Heritage list. up and down the mountain. -And are you enjoying it? Definitely, yes. We are enjoying it. I think it is a very hilly area. And the weather is very cold. You're expecting quite cold weather, I see. You've got me quite worried because I haven't brought a coat like that. Do you think I'll be OK? Oh, that's beautiful, look at that. As the train ascends for 60 miles, the air cools. while up the mountain they average 28.
there is much camaraderie and spontaneous entertainment. passengers are rewarded with gorgeous views. was built into these mountains, then Bradshaw's has the answer. "7,000 feet above the sea, in sight of the Himalayas." in October, bringing it all back down again. And I'll be excited to explore it tomorrow. the historic centre resembles a corner of England. but the architecture is distinctly Home Counties. which served as the seat of power for several months each year. to discuss the partition that would follow independence. I'm meeting a historian and Shimla resident. "Shimla is often regarded as the doyen of the hill stations. "is the political capital of the Indian Empire." even Sri Lanka, and Singapore, were all governed from this little town. And when you mention six months, it's more like eight months. by one narrow mountain path. It's bizarre. from the winter to the summer capital and back again? It was almost like a city on the move. the summer capital, here is this distance of 1,200 miles. between point A and point B. What was the impact of the railways? to stone to make this building. with the social scene centring on the Mall. on the ridge and on the Mall? airing the children for the day. coming up for their shopping. This is where everybody came to show off, to see and be seen. ended up having a very cosmopolitan atmosphere. and the town gained a rather racy reputation. the town somewhat does start getting steamier and steamier. You have the... the fishing fleet coming in. These young girls coming in to India in search of husbands. were the ones who were termed as "returned empties". Kipling wrote an enormous amount about these women. he garnered plenty of material for his novels and poems. And what was the particular attraction of the older women? The safety that she has, and the experience that went with it. and falling in love, attended by squads of servants. and commit his country to modernity. Next time, I play the sport of kings with royalty. I'm moved by India's architecture of passion. the Taj Mahal is the greatest monument to love in the world. And relate to some of the country's most revered animals. Guided by his Bradshaw's 1913 Handbook of Indian, Foreign and Colonial Travel, Michael Portillo travels across India. He embarks on a classic rail journey from Amritsar to Shimla. Along the way he helps to feed the thousands at the world's largest free kitchen and travels the railway routes used by millions of migrants during Partition. He gives his trademark colourful wardrobe an Indian twist, and reaches the foothills of the Himalayas, where the epic Kalka to Shimla hill railway carries him to the former summer seat of the British rulers of the Raj. Published when the British Raj was at its height, Michael's guide leads him to some of the key locations in India's 20th century story, from the massacre in Amritsar in 1919 to the bloody events of Partition. Beginning in the Sikh holy city, Michael is dazzled by the beauty of the Golden Temple and awed by the scale of its langar - the world's largest free kitchen. His route then takes him through the Punjab, India's breadbasket. Michael samples traditional chapattis, has a colourful kurta made up in one of the Punjab's biggest cloth markets, and can't resist the foot-tapping rhythms of Punjabi bhangra dancing, made famous by Bollywood. Portillo's journey also reveals surprises. He uncovers a pioneering women's medical college in Ludhiana, before plunging into Chandigarh, designed by Le Corbusier as a modernist expression of India's post-independence future. At Kalka, Michael glimpses the Himalayas for the first time and joins the 1906-built mountain railway for a stunning climb to Shimla. There, he relives the days when the crème de la crème of expatriate society went to socialise and rule - their exploits recorded by a young Rudyard Kipling.